Brotch Calus is an Imperial commoner and retired alchemist, who lives his life of leisure in his house in the southeastern part of Bruma. He offers advanced training in Alchemy. He rises late at 10am and spends almost the entire day inside his house until he goes to bed again at 2am of the next day. At 9pm, he finally leaves and takes the short walk down to Olav's Tap and Tack, where he will take his dinner until midnight. He will offer his services at all times except when he's asleep, but his house will be locked between 10am and 9pm, meaning you'll have to break in to get training. As he will offer training during his dinner at Olav's and his house is unlocked between midnight and 2am, those are the times it is safe to approach him. He wears a set of common middle-class clothing, a quilted doublet, a pair of linens and doeskin shoes. He carries around his house key and a small amount of gold. When you meet him for the first time, he will introduce himself briefly and get to the point: "Brotch Calus, Alchemist. Advanced Training, available by appointment." 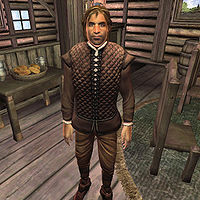 On the city of Bruma, he will give you a bit more information, but will still be a man of few words: "I'm retired from public practice. I only take students in Alchemy to support my hobbies." As an advanced trainer, he can provide you with the necessary reference for the Alchemy Master Training quest. Once your alchemy skill level reaches 70, speak to him, and choose the "training" option, which will trigger the quest as well as the following dialogue: "You're beyond what I can teach. You might think about consulting Sinderion; he knows more about Alchemy than I do. Head to Skingrad, and visit the West Weald Inn. I believe he's currently employed there. In the wine cellar, in fact." Just as he will send advanced alchemists to Sinderion, lesser alchemists will send him their own students as they advance in skill. S'drassa will tell you that "I am the best alchemist in Leyawiin. But if you need Advanced Training, you'll need Brotch Calus in Bruma or Ardaline in Bravil.". Brotch's main AI package is named TrainerBrumaArenaDailySpectator9x12, which hints at an arena in Bruma that was removed during development. Esta página foi modificada pela última vez à(s) 04h52min de 26 de abril de 2013.